In this Football Manager 2018 experiment, we have placed a 32-year-old Alex Ferguson into FM18 to see how he’ll progress. If you missed the previous post in this series, do go back and see how Ferguson made his move from the SPL to the English Premier League. In this post, we see how Ferguson leaves the English Prem to move abroad to Italy! Leicester finished in 6th place in Ferguson’s second year at the club. 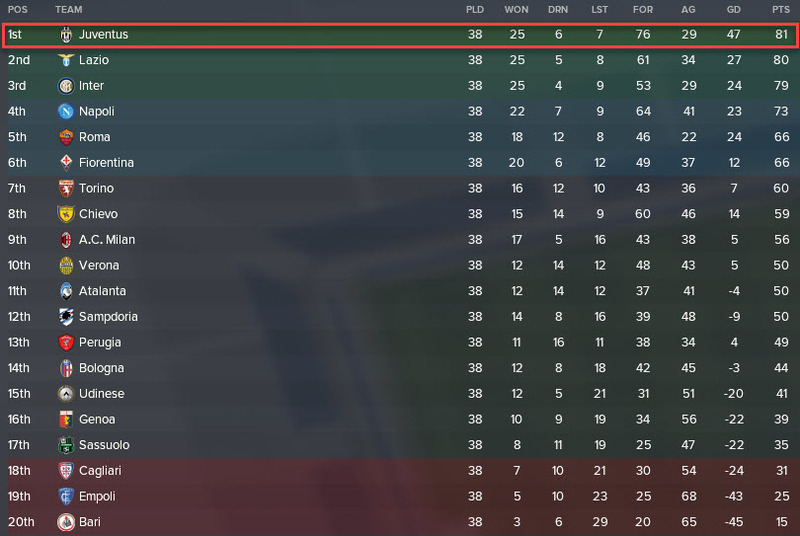 This impressive league season was backed up by a very good showing in Europe. Off the back of their recovery last year to finish in the Europa League places, Leicester progressed into, and through, the group stages. The beat the likes of Montpellier, Lazio and Napoli to meet Spanish giants Barcelona in the semi-finals. A credible 3-2 loss over two legs sent them out, but clearly the signs of progression are there for Ferguson’s Leicester. Leicester finished way down in 10th this season… What does this mean for Alex Ferguson? Did he move on to another club or was he sacked? 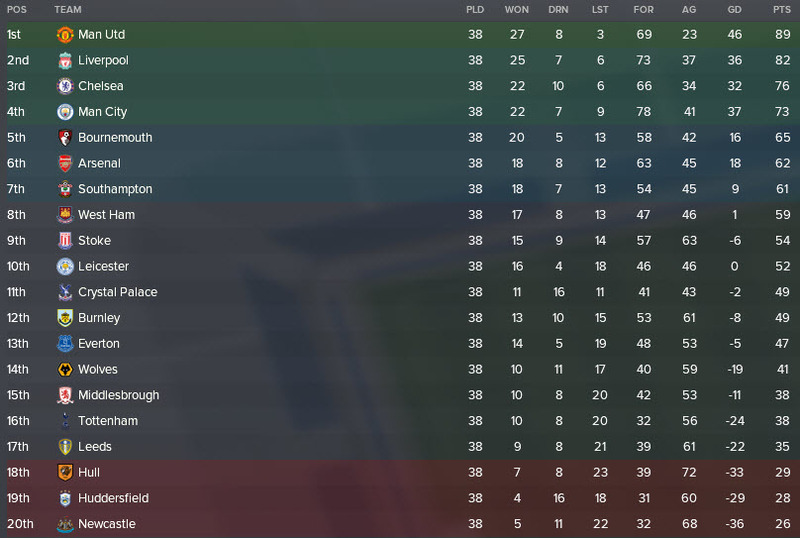 Ferguson was, in fact, sacked by Leicester in March 2036 with his side down in 10th place. Obviously Leicester felt that a change was needed, similar in some aspects to the Ranieri situation back in 2017. 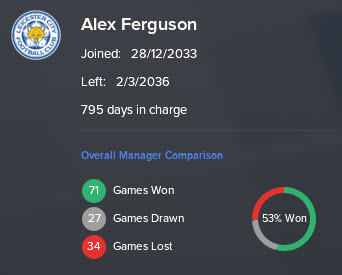 Ferguson ended his Leicester career with a decent win percentage of 53%. He can be very pleased with the performances in Europe but will be despondent with the showing in his final league season with the club. Alex Ferguson must have feared for his top-tier career after two failures in the English Premier League. Maybe a Championship side would pick him up and he could work his way back into the Premier League that way? Juventus had other ideas. The Italian giants approached Ferguson to become their manager in June 2036 and the deal was completed within days. This is an incredible move and one that I did not expect at all. For Juventus to punt on a manager that has managed just to EPL clubs, winning a trophy at neither, suggests how well Leicester’s performance in Europe impacted the move. Did Leicester’s run in the 34/35 Europa League, where they knocked out two Italian clubs in Lazio and Napoli, have an impact on this appointment? Ferguson’s first season with Juventus was a nail-biter. His new side won the Serie A title by just one point over Lazio and two ahead of Inter Milan in third. The title-chase came down to the final day but Fergie’s side managed to squeeze over the line. 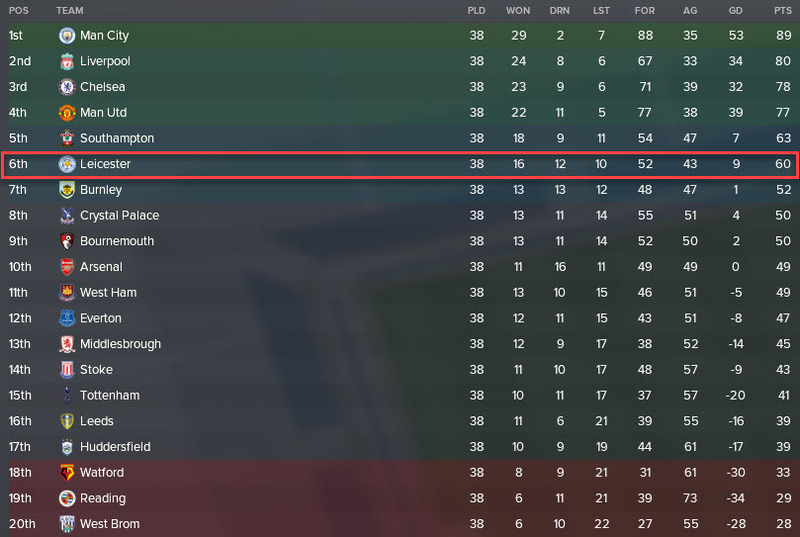 Juventus were expected to win the title and to have left it so close might be a concern for Ferguson, but winning the league is all that matters in the end. Let’s see if he managed to add to his league title with any other competitions. A very impressive showing from Juventus in their cup competitions. They’ll be hugely disappointed to have missed out on progressing through the groups of the Champions League but they will be happy with how they responded. They went on to win the Europa League to add to their Serie A and Italian Cup trophies already in their collection. 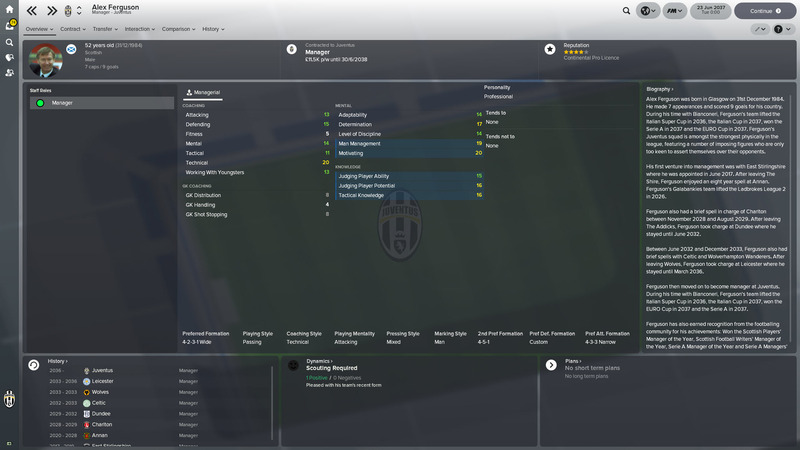 All-in-all a very successful first year for Ferguson with Juventus. The Champions League is surely the goal? I can’t imagine Fergie settling down for a long career in Italy, will he win the Champions League and return to England? Or will his next club be in a completely new country? I’m looking forward to seeing how this develops. Juventus is Alex Ferguson’s eight club in management. He has worked his way up from the depths of Scottish football to reach the peak of Italian football and can be pleased with his career so far. A 44% overall win percent maybe slightly on the lower side, but a sustained period with Juventus will see this shoot right up. In one season with Juventus he has already won 3 cups and one league. Imagine what he could achieve in 5/10 years in Serie A. Looking at where Leicester were predicted to finish, it’s perhaps a bit unfair that Ferguson was sacked by the club. But I think it’s fair to say that it worked out for the best for Fergie! 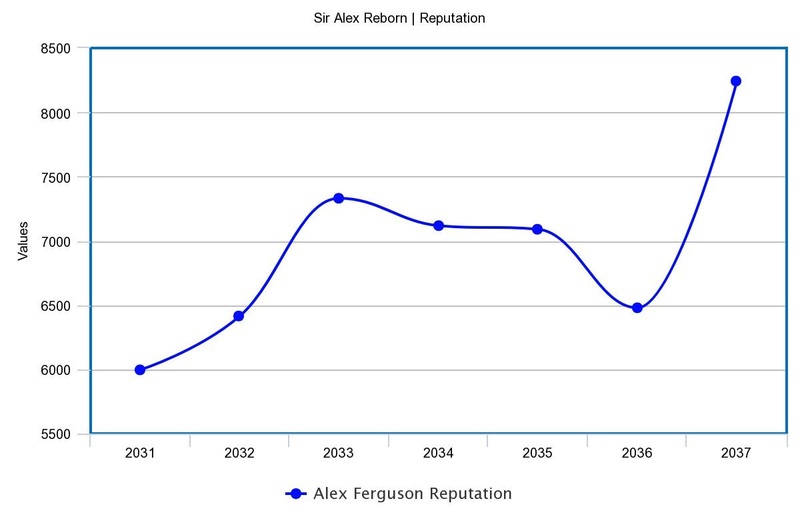 Now at an all-time high, Ferguson’s reputation reflects his move to Juventus. Continued success will only see it rise even further. If you liked this post, please do leave your feedback in the comments! There is now only one post left in this entire series! What are your predictions for the final post? Where will Fergie be by the end of this series? To make sure that you don’t miss any posts on this site, follow our blog to receive an email when we publish a post! Just add your email to the box as displayed either in the sidebar (pc or laptop) or below this post (mobile). 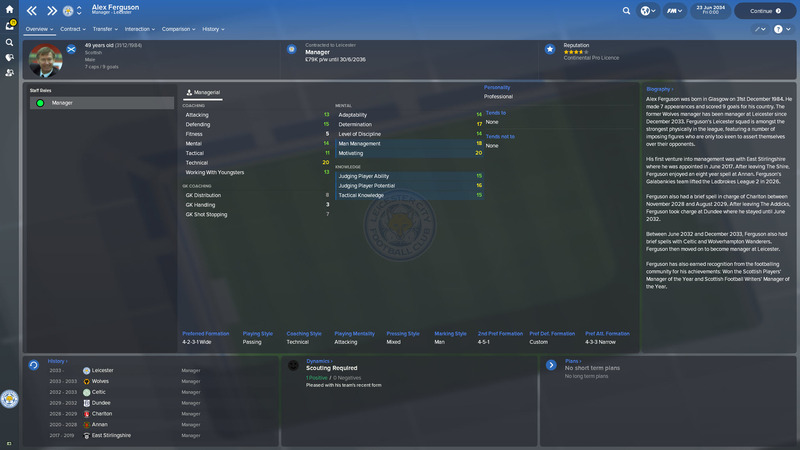 This entry was posted in FM Experiments | Sir Alex Reborn, FM18 Guides, Experiments & Wonderkids, Football Manager 2018 and tagged alex ferguson, english premier league, FM Experiments, fm18, football manager, italian serie a, juventus, leicester. Bookmark the permalink.